Dad was born in the Blumengard Morray District on October 5, 1920. In 1943 he married Sara and moved to New Bothwell. Dad had numerous business ventures. He partnered with Jake Kehler in Bothwell Transfer, and later with Abe Kehler. After the business was sold he continued in the gravel business. After eight years of Kehler Trucking he moved on to work as a bulk milk truck driver for Bothwell Co-op, bus driver and Fairway Ford until his retirement in 1984. 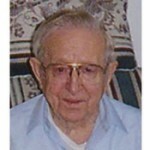 He also served terms as a director in the Bothwell Cheese Factory, Bothwell Credit Union, and Bothwell egg grading. In 1997 they moved to Steinbach and in 2002 to Fernwood Place where he resided until his passing. Dad was admitted to Steinbach Bethesda Hospital on March 9th with pneumonia. He was released on the 19th and was home for two days before feeling ill again. He was taken to emergency Wednesday night and from there to Health Sciences Centre where he died on Thursday from complications. Viewing will be held Monday, March 26, 2007 at Birchwood Funeral Chapel, 150 Penfeld Drive, Steinbach, at 7:00 PM with a devotional at 7:30 PM. The Funeral Service and interment will be held Tuesday, March 27 at 2:00 PM at the Silberfeld Chortitzer Mennonite Church, Hwy 311.